He was born in Cremona in 1957 and graduated from the International School of Violin-Making in 1981. In 1982-83 he worked in the restoration workshop for musical instruments at the Germanisches Nationalmuseum in Nuremberg, under the guidance of Maestro F. Hellwig. In 1983-84 he worked in the private restoration workshop of Maestro J.F. Schmitt in Lion, where he had the opportunity to see and study many instruments of great importance. In 1985-87 and 1991-93 he taught the professional courses on restoration of bowed instruments offered by the Lombardy-Region. In 1988 he participated with a viola at the 5th Triennial International Competition of Violin-Making in Cremona, winning the silver medal. In 1994 he participated with a cello in the 7th Triennial and wining the first place and a gold medal. Since 1996 he has been teaching at the International School for Violin-Making. He is in charge of the maintenance of the instruments that won the Triennial violin-making competitions of the Stradivari Foundation. In 2001 and in 2003 he was a judge at the 1st and 2nd Biennial International Violin-Making Competitions organized by the violin-making school of Queretaro, Mexico. 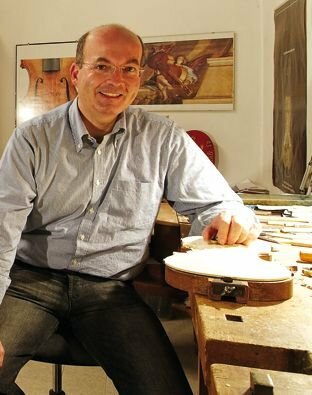 He focuses on the construction of bowed instruments inspired by the classical Cremonese violin-makers and by some of the most important contemporary violin-makers (G. Ornati, F. Garimberti, A. Poggi). His students Akira Takahaschi, Kim ok Kyum and Kim Min Sung have especially excelled in violin-making competitions.